Chances are that at least once per day, you notice how frustrating conventional toothpaste tubes are. The traditional plastic design doesn’t exactly allow for easy retrieval of the toothpaste inside, and you’re always left wondering how much money you throw away at the end of each tube. Barring the extreme solution of cutting open the tube to dig out the very last of the paste, what is the concerned consumer to do? 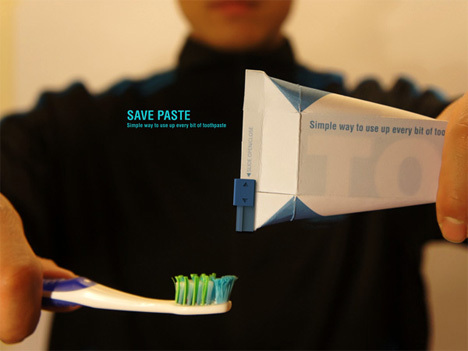 If the SavePaste design by Sang Min Yu and Wong Sang Lee takes off, we’ll never again have to worry about the dregs of toothpaste being disposed of with the other garbage. The simple but brilliant design would allow users to squeeze every last drop of the precious tooth-cleaning stuff out of the carton. 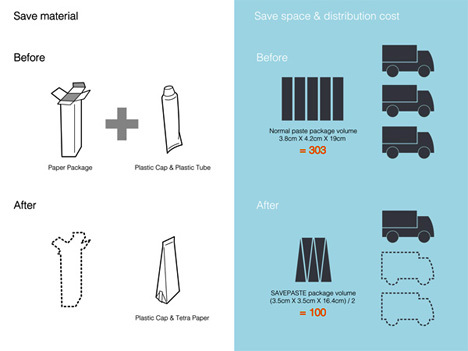 Maybe more importantly, however, is the fact that the package can dramatically cut down on packing and shipping costs as well as waste. Currently, toothpaste tubes come packaged in exterior cardboard boxes which we throw away (or hopefully recycle) immediately. 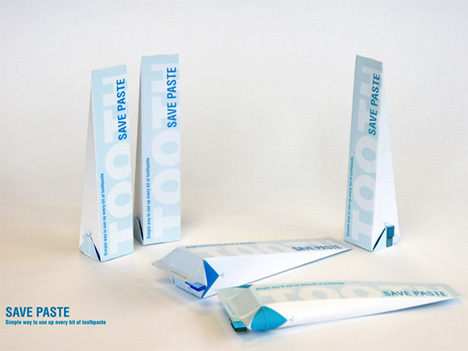 The SavePaste design, on the other hand, requires no exterior packaging. This means that more packs of toothpaste can fit into the shipping containers, cutting way down on shipping costs and associate pollution. 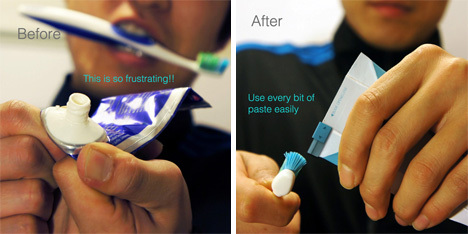 The toothpaste pack forgoes the rigid round collar beneath the opening and allows users to get the very last bit of paste out with no wrestling or cutting needed. 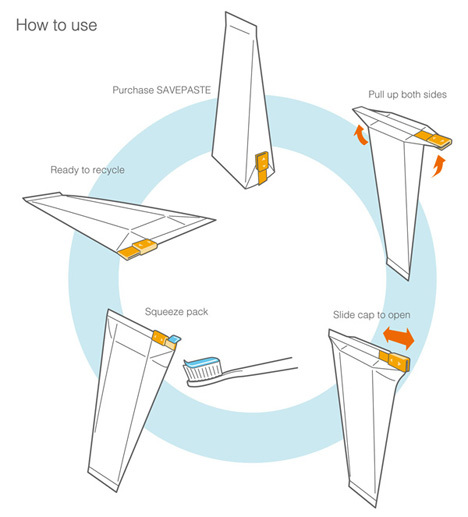 Then, once the pack is empty and flattened, you can simply throw it right into the recycling bin. Simple and Earth-friendly! The most important part of introducing a new design for a familiar product is making it similar enough to the old way that users won’t have a big problem adopting the new way. The SavePaste might look different, but it functions in a way that is very like the traditional toothpaste tube – other than the fact that it solves one of the most maddening household problems of all time. If we were betting people, we’d place money on this design going down very easily with just about everyone.